1. Place the raw cashews into a bowl of room temperature water so that it covers the cashews, drape a paper towel or tea towel over the bowl to prevent dust settling, and soak overnight. 2. Preheat oven to 350 F (177 C). 3. Place the soaked cashews, 1/2 cup fresh water, and coconut oil into a blender and blend until smooth. 4. 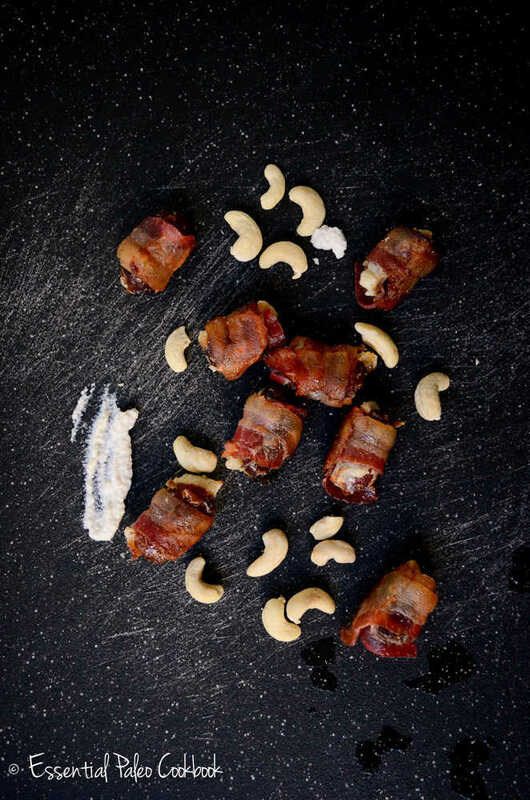 Slice each date along one side so that it opens up and fill each date with the cashew ‘cheese’ and close it up. Wrap one of the half-slices of bacon around the date and place on baking tray with sides (as the fat from the bacon tends to run). 5. Bake for 20 minutes before flipping the bacon-wrapped dates over (with tongs). 6. Bake for another 10 minutes (i.e. for a total of 30 minutes).